Contaminated worker clothing has been identified as a source of exposure to respirable dust. If this respirable dust contains silica, it may cause the worker to develop silicosis, an irreversible lung disease. NIOSH and Unimin Corporation, the largest manufacturer of silica sand in the United States, have developed a clothes cleaning system that is able to clean dusty work clothes throughout the workday. 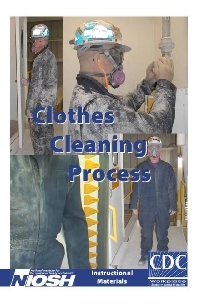 This clothes cleaning system is a quick, safe, and effective method to safely remove dust from a worker's clothing without exposing the worker, the work environment, or co-workers to increased health and safety concerns. This system consists of four major components: a cleaning booth, an air spray manifold, an air reservoir, and an exhaust ventilation system. Before entering the cleaning booth, the worker must don an approved fit-tested, half-mask respirator with HEPA quality filters, hearing protection, and full seal safety goggles. Upon entering cleaning booth, the worker activates a start button, spins slowly in front of an air spray manifold, which takes approximately 18 seconds, and then exits the booth with clean clothing. This process has been proven to be more effective in removing dust from a worker's clothing than methods currently being used. Although this process was designed for workers in the mining industry, it is applicable to any industry where contaminated work clothing is a problem. This Clothes Cleaning Process is not currently approved on a general basis by MSHA. To implement this technique, a 101 Petition for Modification must be submitted and approved for a specific installation. Clothes Cleaning Process video - available in streaming format (RealMedia) and DVD from this page. This video can be streamed from YouTube or a ZIP file containing a WMV file and a SRT closed caption file can be downloaded for local playback when streaming is not feasible. To use the ZIP file, download it to your computer and expand the contents into a folder of your choice. The SRT caption file will provide closed captions when using a compatible media player.